The LA Times gets into the swim in Las Vegas. Since he went to Baghdad at the head of the Surge, my son John and I have been planning a celebratory cruise through the sagebrush sea on his return home. 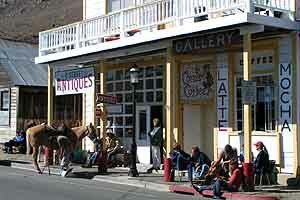 Cora’s Coffee House & Horseshoe Emporium in Virginia City, a great place to begin a journey. Last month we spent four days out in the quieter parts of the state, and I recommend the experience (and the route) to anyone. 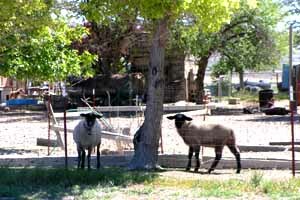 We set out from Virginia City, just a mile from home and the perfect jumping off point for the wilder regions of Nevada. After a bracing beginning at Cora’s Coffee we took the steep, twisting Six Mile Canyon Road east to US 50. This was once a major highway, and it was up this road that a galloping rider brought the news of Lincoln’s assassination to Virginia City in 1865. It was paved a few years ago and the steep, curving ribbon of asphalt now serves as a prime commute route from the bedroom communities of the Dayton Valley to Reno and Sparks. We promised ourselves: no schedules on this trip, we’re just going to follow the fun. 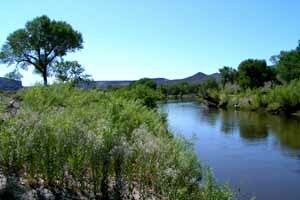 In this case it brought us to the Carson River. five-year-old who used to pedal his bike around Gold Hill had become this big ranger-trained paratrooper Captain. Just how does that happen? We spent most of another hour inspecting the post. After 15 months in Baghdad John found it easy to imagine the lives of the soldiers in their adobe barracks under the burning sun. to life from time to time. US 95A is just a mile east of the fort, and we took it south across the Carson River, where the Simpson Road comes in from the east. 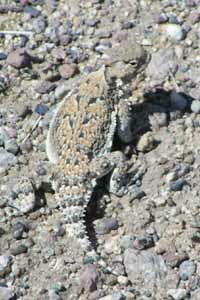 We had Fort Churchill to ourselves except for this horned toad. This is the wagon road established in 1859 by Captain James H. Simpson from Camp Floyd, near Salt Lake City, to Genoa. Simpson’s expedition set out on May 2, 1859, arriving at Genoa on June 13. Upon his return to Camp Floyd in August, Simpson announced that his new route was 288 miles shorter than the Humboldt Trail, with plenty of water and grass along the way. 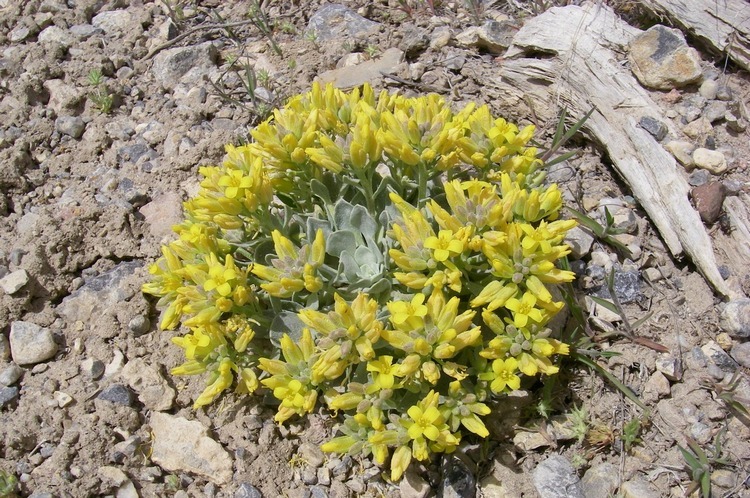 We saw a zillion wildflowers along our way. The 20 miles from US 95A to US 95 is mostly easy, still a good wagon road, but with a few sandy places and some washouts that would pose a challenge to the family sedan. We averaged about 15 mph, far faster than Simpson’s wagons, and turned north when we struck the pavement, arriving in Fallon a little past noon. Our strategy for provisions relied heavily on the deli section of the Raley’s stores sprinkled across northern Nevada, and we sandwiched up for the next leg of the journey. These outlying Raley’s also stock Ruby Mountain Amber Ale, a vital part of our diet. We went east from Fallon on US 50 to Stillwater, once upon a time the Churchill County seat, a green and gracious stretch of bottomland now largely given over to an Indian Reservation. After a quick visit with a friend, we zigged north and zagged east, eventually finding East County Road and continuing north. Half an hour along we saw fighter planes from the Fallon Naval Air Station sweeping past overhead, playing tag between the ancient crags that enclose the valley, while we barreled along below, suspended between past and present, a roostertail of dust billowing up behind us. When we reached the south end of the Humboldt Range we turned east around it to enter Buena Vista Valley. Unionville, in a side canyon on the west side was a promising silver camp in 1861, and attracted a small army of prospectors including Sam Clemens, later Mark Twain. “Unionville consisted of eleven cabins and a liberty-pole,” he wrote in Roughing It. “Six of the cabins were strung along one side of a deep canyon, and the other five faced them. The rest of the landscape was made up of bleak mountain walls that rose so high into the sky from both sides of the canyon that the village was left, as it were, far down in the bottom of a crevice. It was always daylight on the mountain tops a long time before the darkness lifted and revealed Unionville.” Sam spent three weeks in the frenzied search for silver here. 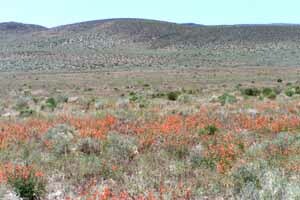 Unionville is a narrow stripe of green in the sagebrush. 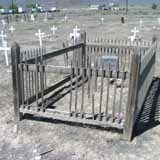 Unionville prospered for a time, but lost the county seat to Winnemucca in 1873. Today it is an attractive collection of homes sprinkled with historic remnants, grazed by cows and graced by the long-established Pioneer Garden Bed & Breakfast, but no store, no gas pumps, not even a Coke machine. After meandering the length of the beautiful “crevice” — Buena Vista Canyon — we pressed on north to I-80, and east to Winnemucca for the night. 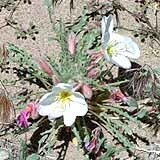 I am told there are more than 3,000 motel rooms in Winnemucca, ours was at the Red Lion, a bright and cheerful haven in the unbounded sea of sagebrush we had traversed. The Griddle, apex of the Nevada food pyramid. 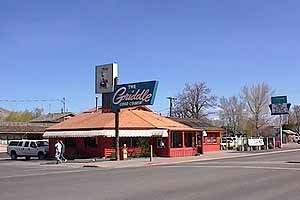 In the morning our first stop was at The Griddle, Winnemucca’s sacred shrine to the American Breakfast. Over sausage and waffles and eggs John told me he might look for a place near Winnemucca. 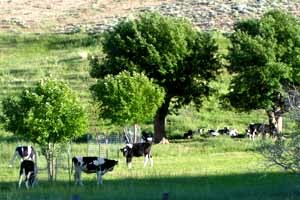 Paradise Valley, maybe, or in the shadow of the Sonoma Range to the south. 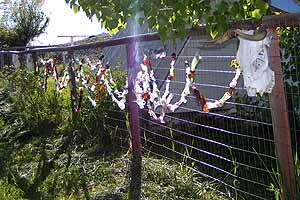 He likes the sunny skies and friendly openness here, and the cowboy heritage. I like the idea of John being in Nevada, not just because I’d miss him if he were far away, but because we need more like him here. Second stop was at the Raley’s to gather provisions for the day’s journey, and then we were outta there, taking the same route east that the Wild Bunch used after they robbed the bank in 1901. As they galloped away, a deputy sheriff commandeered a steam engine that was fired up and waiting, and chased after them, standing on the cow catcher with a rifle at the ready. 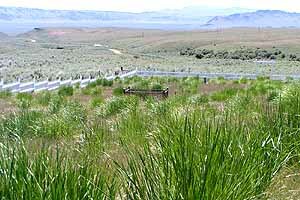 The bank robbers were kept close to the tracks by a barbed wire fence, but it ended before the locomotive got within rifle range and they dashed away across the sagebrush as a mounted posse took up the chase. But they got away clean. made a pilgrimage to Waterhole #1, famous 30 years ago as the home of Waterhole Ike, a pig with a bank account and a red flag at the IRS. Ike was the property of Mark Crowley, the proprietor of the little bar at the time, and was earning stud fees so Mark opened a bank account for Ike. The publicity about Ike’s stud fees and tax liability made Golconda mildly famous for a season, and the yellowed clippings still adorn the walls. 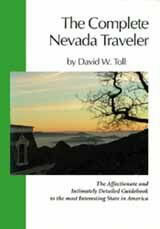 You can read the whole story there, or in the just-published new edition of the Complete Nevada Traveler. End of the trail, Golconda. The road east from Golconda slides around the north side of the Golconda Summit (I-80 goes around the south side). It’s paved for the first 15 miles and then graded gravel another 25 miles of beautiful country to Midas. 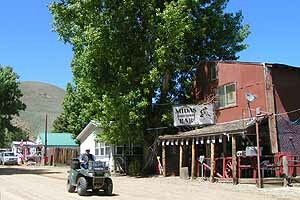 Midas is one of the early 20th century mining strikes that helped bring Nevada back to life after 40 years of decline. There have been more downs than ups in the 100+ years since then, but Midas is on an upswing now, with mining active again and dinners being served at the bar. Heavyweight champ Jack Dempsey, a big Nevada-lover himself, came here to go hunting with friends and ran up and down Midas’ dirt street, feinting and jabbing as he went, building endurance in the crisp autumn air. We ended our explorations of the little town at the cemetery, a dreamy meadow enclosed within a gleaming white fence, with our picnic of Raley’s sandwiches and Ruby Mountain beer. It was here John told me how serious he was about Katie, and I imparted to him the secret system for preventing mayhem in intimate relationships. I would tell you too — it’s quite simple, really — but some people enjoy these clashes too much to give them up, and I’d hate to deprive anyone of their private pleasures. But if you’d like to be in on the secret, just send me an e-mail. From Midas it’s another 35 miles or so to Tuscarora, past Willow Creek Reservoir and over the Tuscarora Mountains into Independence Valley. The road is an easy drive through such a classical western landscape we expected to meet a stagecoach coming around every bend. 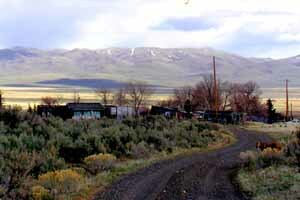 Tuscarora is a remnant village in what was once a major mining city on the far frontier. 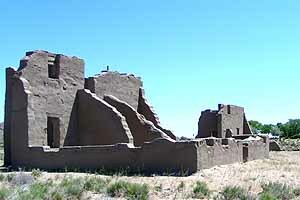 Dating from 1867 and named for a Civil War gunship on which one of its discoverers had served, Tuscarora once boasted one of the largest Chinatowns in the west. Nowadays its population skews heavily to the artistic. The celebrated potter Dennis Parks established his studio and his family here in 1972. He drew like-minded souls in his wake, and the town presents an antic combination of new age antiquity. The studio is now an internationally famous school, operated by Ben Parks, Dennis’s son, with two two week sessions each summer. You can visit the school and buy pottery without a scheduled visit; just wander in and then see Julie at the Post Office if you want to make a purchase. A “float” in the Tuscarora Independence Day Parade, 2007. 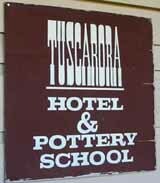 From Tuscarora the 50-mile drive to Elko takes about an hour, and when you arrive you’ll feel the shock of sudden immersion into city life. It is the most benign form of city life imaginable. I know I have harped on Elko’s transformation before, but I can’t help myself. This is now the Coolest Little City in the World, and I will explain why in the next NevadaGram, which will follow our course from Elko via Wells and the Ruby Marshes to Eureka and then on via Belmont, Manhattan and Hawthorne back to Gold Hill. Oh, and you can read John’s take on our trip too. 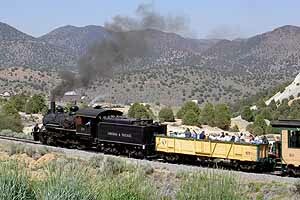 The V&T is now operating on steam between Virginia City and Gold Hill again. Repairs have been completed on #25 and the diesel locomotive used in the interim has been parked in the engine house, hopefully for good. . . .Specialty license plate sales in Nevada generated $3.8 million in revenue last year . . . Janet Geary is the new publisher of Nevada Magazine . . . Did you know Carson City will celebrate its sesquicentennial (that’s the 150th anniversary, students) next year? The official date is Aug. 12, the day the deed was signed transferring Eagle Ranch from J.B. Mankins to the founders of the city, but since that’s a Tuesday in 2009, the big celebration will the place August 15, 16 & 17. This is just a heads-up so you’ll be ready . . . The airport at Bullhead City welcomes a steady stream of charter planes bringing junketeers to Laughlin. Don Laughlin’s Riverside Resort and Vision Airlines started a new turbo-prop service connecting North Las Vegas, NV; Mesa, AZ and Carlsbad, CA with three direct flights a week. 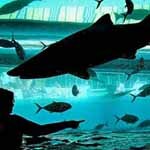 A 3 day/2 night package, inclusive of room and air service, all taxes, fees and transfers, starts at just $129. But wait, there’s more: the Edgewater and Colorado Belle Hotels and Casinos has partnered with JetExpress and are offering three day/two night room packages on 50-passenger jet service direct from Ontario, CA for just $179 single/double occupancy . . . Not only that, Sun Country Airlines paired with several Laughlin resorts to fly customers from twenty-two (and growing) mid-western and southwestern destinations. Also, SunFest Airlines packages rooms plus jet service from Edmonton, Calgary, and Vancouver to Laughlin and Allegiant Airlines operates regular charter flights direct from cities all over the US to Harrah’s Laughlin. And on top of all that, the Laughlin/Bullhead City International Airport has announced that matching funds needed to secure a national carrier bringing regularly scheduled air service has been met by grants and local businesses . . . This is the hand that beat four aces at the Carson Valley Inn. 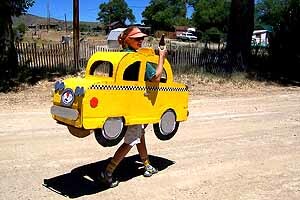 How would you like to have been Jim Hammer of Minden at the Carson Valley Inn a few weeks ago? He was playing Texas Hold ’em and had two aces in the hole to go with the two aces, 10, jack and king of hearts showing on the board. 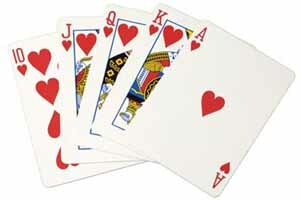 How was he to know that one of the other players, Randy Meyer of Gardnerville, held the queen of hearts in the hole — his first Royal Flush ever. Needless to say, when Jim and Randy turned over their hole cards all eyes were as big as saucers and a hush fell over the table. But what do you know, they were both winners. The Carson Valley Inn pays a $1,000 “Bad Beat” cash prize whenever a hand of four-of-a-kind or better is beaten by a higher hand. $500 goes to the beaten hand, $300 plus the pot to the hand winner, and the remaining $200 is split between the remaining players at the table. Roadside America provides directions to offbeat attractions around the country, including these odd Nevada items . . . 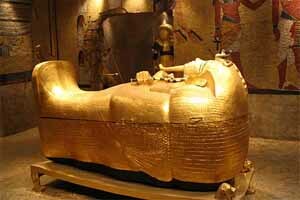 The Egyptian-themed attractions inside the Luxor Hotel Casino in Las Vegas are gone. The reproduction of King Tut’s burial chamber with all of the “authentic reproductions” from the tomb has been donated to the Las Vegas Natural History Museum. King Tut’s sarcophagus will soon be established a room or two away from a 3,000-gallon tank swarming with sharks, stingrays and eels . 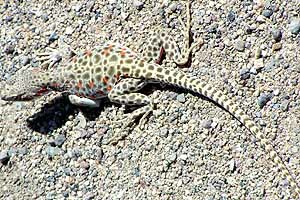 . . Don’t you miss Rich Moreno and his Backyard Traveler columns? He’s back! Not physically, his protoplasm is still firmly planted in Illinois, but his virtual presence is now online in his Backyard Traveler Blog . 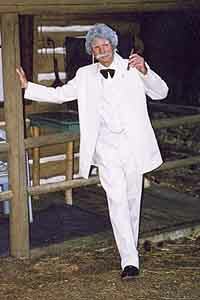 . .
And speaking of Nevada’s stars, here’s an article about McAvoy Layne, the Ghost of Twain . . . Drought has brought about a rapid decrease in water levels at Lahontan Reservoir between Fallon and Silver Springs and historic low levels are expected before the end of summer. The Silver Springs and North Shore Marina docks have been removed and the launching ramps are closed. Reduced water levels expose underwater hazards, and boating is now dangerous and boaters are being advised they do so at their own risk . . . The Reno-Sparks Convention and Visitors Authority has a freshly redesigned website . . . And why am I always the last to know? Stephen Moise, the Executive Chef for Resorts West at Lake Tahoe has been sharing his personal recipes, focusing on the summer season’s favorite flavors, at Zephyr Cove on Tuesday afternoons from 5 to 6:30 pm. Cost is $10, and you get the day’s recipes, a glass of wine and parking in the bargain. He’s already done barbecue, salads and dressings, kids’ cuisine and desserts, and winds up the series with a flourish August 5th with (tada!) Clambake. For Reservations Call 888-896-3830.